Peter Hamilton from Zurich considers why we sometimes take a negative perspective of UK protection and why it's time to be positive. Within the protection industry, we’re pretty good at finding fault with ourselves, whether it’s insufficient innovation, difficult processes or an increasing protection gap. It’s good, and important, that we are ready to look for ways to improve, and in areas we certainly need to, but I sometimes wonder if an overly negative perspective can become contagious and possibly self-fulfilling. Things are looking brighter now than in recent years in the world of Protection – more customers are buying more products, more companies are spending more on new developments, enhancing products and processes, and new technology is opening up new opportunities, while new entrants are waiting in the wings. 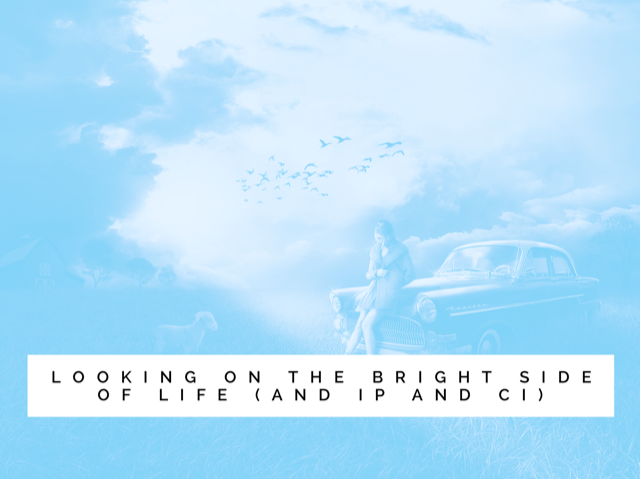 It’s not all perfect, but it’s good to look on the bright side of life (and IP and CI) from time to time. When looking to shed some light on reasons behind the recent growth in protection sales, best to start with some luminaries. Paul Shearman at Openwork, Jeff Woods at Sesame Bankhall and Tom Baigrie at LifeSearch are driving protection forward in different ways at different firms, and I asked each what they thought might be behind the positive momentum we’re seeing. Tom reflected on how it will have helped that we’re coming out of a period where many were wondering how best to cope with regulation, most obviously the Mortgage Market Review. Thousands of hours have been spent ensuring rules are understood and complied with, with less of a focus on marketing and promoting the solutions we offer, but now we’re in a ‘business as usual phase’. LifeSearch have been busy active building alliances with advice firms whose own focus may be elsewhere – and they’ve not been alone in doing that – Reassured, Futureproof, DLP and Cura are further examples of specialist firms working with wealth and mortgage advisers to help clients get cover. Tom’s firm also continue to promote positive protection stories in the national media; stories which will reflect well on them but also on the industry more broadly, and they set significant store by adviser training. For our own part at Zurich, in an attempt to reinforce the fact that collectively we do pay out, took out advertising at rail and tube stations and elsewhere highlighting that across our Life and GI book, we paid 99% of claims in the previous year. Numbers help, but stories are more powerful, and there will always be the need to promote the human and emotional aspects of what we do. Paul Shearman at Openwork talks about how they’ve helped advisers get the protection message across. “From an Openwork perspective, we see protection as the cornerstone of financial planning and have done for many years, as demonstrated by having protected over 180,000 customers last year alone. We are constantly looking at ways to improve the quality of our protection advice and believe we are leading the market in this regard through innovations such as the introduction of our Personalised Risk Report last year, which is provided to clients automatically during the mortgage process’. The Report, Paul says, ‘is a great example of the use of big data, utilising information from a range of industry sources (e.g. insurers, re-insurers, ONS) to provide customers with a personalised assessment of the probability of certain life events happening during the term of the loan (such as death, critical illness, or two months or more off work). This risk assessment is then integrated into quote data from iPipeline’s Solution Builder system to generate the cost of mitigating these risks - all produced automatically in one simple, professional and personal client facing Report’. Both Openwork and Sesame Bankhall Group are seeing increased protection business alongside remortgages and first-time buyers, even if there are fewer house movers than we may have seen historically. Jeff also stresses the fact that ‘having relevant conversations that resonate with a client, rather than simply selling features and benefits of a product is helping clients understand their needs on an individual level’. He also echoes Paul’s point, saying that ‘tools and technology now available in the market enable simple demonstrations of a client’s personalised protection gap’. It would be good to think this positive momentum can be sustained. State benefits continue to diminish, with the change to Mortgage Interest support due in April being just one more reduction. Customer needs will only grow. There are new technical developments, innovations, more personalisation of products and propositions, alliances, education, and new entrants. And we’re still paying the vast majority of all claims to customers and their families, changing lives immeasurably for the better. All are reasons to be cheerful.